The What: ClearOne has begun shipping COLLABORATE Live, a series of four video collaboration solutions designed to provide a complete video collaboration experience for any size room. 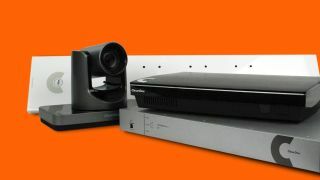 The What Else: For large boardrooms, auditoriums, conference rooms, lecture halls, courtrooms, training centers, and telemedicine facilities, COLLABORATE Live 900 delivers a complete, professional-quality collaboration system solution featuring a combination of video components integrated with advanced audio DSP technology. COLLABORATE 900 features a suite of built-in videoconferencing capabilities including a Skype for Business client, SIP/H.323 videoconferencing, wireless presentation, interactive whiteboard, and recording and streaming. It also includes a CONVERGE Pro 2 DSP mixer, advanced audio processor, and ClearOne’s Beamforming Microphone Array 2, which features adaptive steering technology to provide audio pickup coverage of an entire room. For high-quality video capture of all participants in the room, the COLLABORATE Live 900 comes with the UNITE 200 PTZ 1080p60 camera with 12x optical zoom. The system also includes a 90-day free trial of the ClearOne COLLABORATE Space cloud-based videoconferencing application. COLLABORATE Live 600 is a video collaboration system that delivers clear, full-duplex audio for medium-sized conference room environments. It offers the same suite of built-in videoconferencing capabilities, the UNITE 200 PTZ camera, an ultra-friendly user interface, and a 90-day free COLLABORATE Space trial subscription. For audio, the system features two ClearOne CHAT 150 speakerphones that daisy chain with CHATAttach. The COLLABORATE Live 300 system is engineered for users looking for a complete small-room and executive office video collaboration solution. Featuring the same user interface found in the larger room systems, COLLABORATE Live 300 includes a free 90-day COLLABORATE Space web conferencing subscription, a Skype for Business client, SIP/H.323 videoconferencing, wireless presentation, and interactive whiteboard capabilities—along with one CHAT 150 speakerphone and one UNITE 150 PTZ camera with 1080p30, 12x optical zoom. Rounding out ClearOne’s new COLLABORATE Live product line is COLLABORATE Live 200, a new video collaboration system with ultra-wide angle video capture, critical for viewing all conference participants in huddle spaces and smaller room environments. Designed specifically to meet huddle space budgets, COLLABORATE Live 200 features the UNITE 50 EPTZ 1080p30 camera with 3x digital zoom and a 120-degree, wide-angle field of view. Other features are similar to those found in the COLLABORATE Live 300 system, including the free 90-day COLLABORATE Space subscription. “Video is central to the 21st century collaboration experience,” said ClearOne CEO and chair Zee Hakimoglu. “Users should be able to have the video collaboration system that is right for them in their own unique environment. Also, COLLABORATE Live enables users to enjoy a user interface that is as intuitive and simple as using their familiar mobile or tablet devices. The new COLLABORATE Live Series will be showcased at ISE 2019 at Stand D-130 in Hall 11 at the RAI Centre in Amsterdam, and is available for immediate delivery. The Bottom Line: COLLABORATE LIVE is designed to empower users to collaborate in any size room environment, with high-quality audio and video, interactive whiteboard, presentation, recording, streaming, and cloud connectivity. MSRP for the systems is as follows: COLLABORATE Live 900, $9,999; COLLABORATE Live 600, $6,999; COLLABORATE Live 300, $3,499; COLLABORATE Live 200, $2,799.